Frank H. Wu, who has appeared on national television and radio and written for mainstream and ethnic media as well as at The Huffington Post, has been working on civil rights and public policy since he was a teenager in Detroit and the Vincent Chin killing occurred. He has been an advocate for Chinese Americans, calling on all Asian Americans to stand up and speak out. He will share an inspiring story about how to become involved, explaining the importance of participating in our diverse democracy. Asian Americans are the fastest growing populations in the United States, and much of this new growth is driven by immigration from China and India. Asian Americans tend to be highly educated and have high incomes, but they also have the lowest rates of civic and political participation. This is a major problem that needs our concerted attention. Civic engagement is critically important, not only for the protection and empowerment of our communities, but also for developing the “soft skills” that can help employees break the bamboo ceiling. Chinese civilization is enjoying a renaissance on a global scale. In this session, our distinguished scholars will offer their insights about the nature of Chinese civilization and its most important values. They will also share their perspectives on how Chinese civilization and its values can best illuminate Chinese American’s way of life and enrich our all American experience. Chinese Americans are a coalition identity, spanning different origins, generations, dialects, and political perspectives. They have worked with Asian Americans, a pan-ethnic coalition that is unique to our diverse democracy — as moderator Frank H. Wu has said, “There are no Asians in Asia.” Even as the nation recognizes its changing face, with race no longer being literally black and white, Chinese Americans have struggled to achieve political power. In a diverse democracy, coalitions have been crucial. This panel will consider, with practical “take home” suggestions, how Chinese Americans can come together with others to achieve shared goals. Defending Civil Rights – A Conversation with Sherry Chen, Xiaoxing Xi, and Peter R. Zeidenberg, Esq. Speakers: Xiaoxing Xi, Sherry Chen, Peter R. Zeidenberg, Esq. The increasing mistrust between the United States of America and China, partly triggered by the rise of China, has caught many Chinese American scientists in the crossfire between these two countries. Overzealous prosecution and the practice of racial profiling by government agencies have resulted in Chinese American scientists such as Wen Ho Lee, Xiaoxing Xi and Sherry Chen, among others, being wrongly accused of espionage. This session will examine this great miscarriage of justice through historic facts and personal experiences of the victims. Chen, Xi and their defense attorney Mr. Zeidenberg will share a riveting account about prejudice, fear, suspicion and courage they have experienced. China’s rapid economic growth and increasing regional and global influence have unexpectedly shifted the geopolitical terrain in Asia-Pacific. As a result, U.S.-China relations have evolved to a complex mix of increasingly intertwined economies and societies, growing international rivalry and intensifying diplomacy. In this session, in light of the upcoming American general election, two renowned “China Hands” will address the foreign policy complexities presented by the economic growth of and tense geopolitical situation surrounding China, and how our foreign policies should evolve to best cope with the challenges while promoting bilateral cooperation. The panelists will also discuss the impact that our China policies have on Chinese Americans. China’s rapid economic growth has brought a tremendous influx of Chinese investments into the US, and generated unprecedented impact on Chinese Americans and our communities. 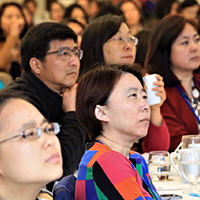 In this session, well respected, seasoned investors and distinguished business school professors will discuss the future of US-China economic relations as well as the challenges and opportunities presented to Chinese American communities and Chinese Companies. In this session, we will showcase Chinese Americans who have led by their own examples to engage in American civic and political life. Their contribution and exemplary influence will inspire many others to follow their footsteps and contribute more to this great country. Chow, a Chinese former artistic gymnast, is the founder, owner and head coach of Chow’s Gymnastics and Dance Institute in West Des Moines, Iowa. He is notable for being the coach of 2008 Olympic balance beam champion Shawn Johnson and 2012 Olympic individual all-around champion Gabby Douglas. Chow was on China’s national gymnastics team for more than a decade, winning numerous national and international medals. He moved to the United States in 1991 after having accepted a position as the Assistant Coach for the University of Iowa’s gymnastics program. Born and raised in California, Denise Gitsham is the only daughter of immigrants, a small business owner, and a leading voice for San Diego’s Innovation Economy. 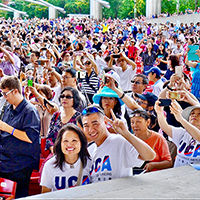 Denise’s mother, a Chinese immigrant who came to the US via Taiwan, and her father a Canadian immigrant who served 20 years in the United States Air Force, instilled in her a deep appreciation of the blessings associated with being American. A graduate of Georgetown University Law Center, Denise has worked in the US Department of Justice, United States Senate, and White House. She practiced law at the prominent international law firm K&L Gates before joining a San Diego-based renewable energy company in 2009. Today, Denise owns her own small business, and works to promote San Diego’s Innovation Economy, which is driving our local economy and creating high-paying jobs for San Diegans. Conrad Lee is Bellevue’s first minority City Council member, the longest continuous serving member of the council and the first mayor (2012 – 2013) of Asian (Chinese) ancestry. The veteran council member also serves on the Association of Washington Cities Federal Board. For many years he was Bellevue’s representative on the National League of Cities, and is a past president of the NLC Asian Pacific American Municipal Officials. In addition, he has been a member of the Economic Development District Board of the Puget Sound Regional Council. Conrad holds a master’s degree in business administration from the University of Washington and a bachelor’s degree in engineering from the University of Michigan. Born in China, Conrad grew up in Hong Kong and has lived in Bellevue since 1967. He and his wife Winnie live in the Somerset neighborhood, where they raised their two children, Christopher and Jennifer. They have three granddaughters. Theresa Mah is the newly-elected Democratic Nominee for Illinois 2nd District State Representative. When she takes office in January, she will be the first Asian American ever to serve in the Illinois General Assembly. Prior to running for elected office, Dr. Mah taught for 15 years at the college level. She came to Chicago 25 years ago to earn her Ph.D. at the University of Chicago. 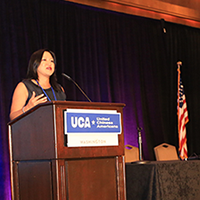 In her most recent position as a Senior Policy Advisor and Director of Asian American Outreach in the Office of former Illinois Governor Pat Quinn, she oversaw the implementation of the Asian American Employment Plan as well as other efforts to promote diverse representation in state government. She served as the Governor’s representative in the Asian American community and advocated for the state’s 600,000+ Asian Americans, bringing their issues and concerns to the highest levels of state government and working on policies to address them. Cindy Wang is a sophomore at the University of Pennsylvania. Originally from Overland Park, Kansas, Cindy has brought her commitment and passion for service from the Midwest to the East Coast. She has previously served as President of the KCCAA Youth Hope Fund, a student-run non-profit organization dedicated to providing worldwide disaster relief and humanitarian aid. Under her leadership, the organization raised over $11,000 in two years for victims of Hurricane Sandy, the 2012 Haiti Earthquake, and impoverished children in Yanzibian, China. Currently, Cindy is pursuing a Political Science degree with minors in Consumer Psychology, English, and Mandarin Chinese. Michelle Wu is the President of the Boston City Council. She is the first Asian American woman to serve on the Boston City Council, as well as the youngest current member. In January of 2016, she was elected as President of the Council. Born in Illinois on January 14, 1985, Michelle Wu graduated from Harvard University in 2007 and Harvard Law School in 2012. Wu worked as the Constituency Director for Elizabeth Warren’s 2012 campaign and was elected to Boston City Council At-Large in 2013. Organizing or mobilizing Chinese American community for more civic and political engagement is often a frustrating if not thankless endeavor. However, over the years, we have seen progress being made in our community. Such progress is attributed to the efforts of our tenacious community leaders in various Chinese American organizations. This session has gathered the most experienced Chinese American community leaders. They will share with us what their journey is like, what are the rewards and challenges working in the community and how we can together make our community more civically and politically engaged. From CACA to OCA to CCBC, respected leaders from these organizations will sit on one panel, share with you their stories and visions.